This is a remote museum located near the museum of human evolution and gives all the information about Burgos right from its origin to the present. This is a place where you can see objects from Atapuerca and OjoGuareña, as well as from the Iron Age necropolis of Miraveche, Ubierna and Villanueva de Teba. There are Roman artifacts from the city of Clunia present here as well. Casa De Miranda: This palace built in the 16th century houses the museum and the palace is a gratifying wonder to look at. It has numerous important points that you shouldn’t be missing out on. Corner House Inigo: This site just like the Casa De Miranda belongs to the 16th century and was inhabited by the family of Inigo Angulo back in the day. Do not miss any of the pieces housed in the museum. A remote museum in Casa de Miranda ensure that you don’t miss it. Free on weekends, 23 April, 18 May, 12 October and 6 December. Free for over 65s, retired persons, pensioners, students, and under 18s with ID. How popular is Museo De Burgos? People normally club together Parque De La Isla and Ermita De San Amaro Peregrino while planning their visit to Museo De Burgos. People also prefer to start their day with Museo De Burgos. Cool museum, sharing the local history. Was really interesting to see the sword of El Cid. Enjoyed another visit, - well worth seeing. 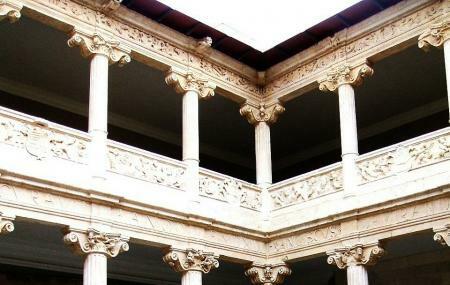 Located in two merged palace, Casa de Miranda and Casa de los Angulo. It is a nice museum of provincial art, the collection covers the entire history of Burgos. Nice staff. Free entrance. Brilliant museum with combination of artifacts and art.